We recently finished this rather large letterpress wedding system designed by Priya Patel. Check out her fashion forward blog Love Made Visible. We asked her about the design: Priya: "The background for the design is that the couple are to be married in a botanical garden and the bride Neerja was really inspired by traditional Indian miniature paintings which often depict figures in natural settings. 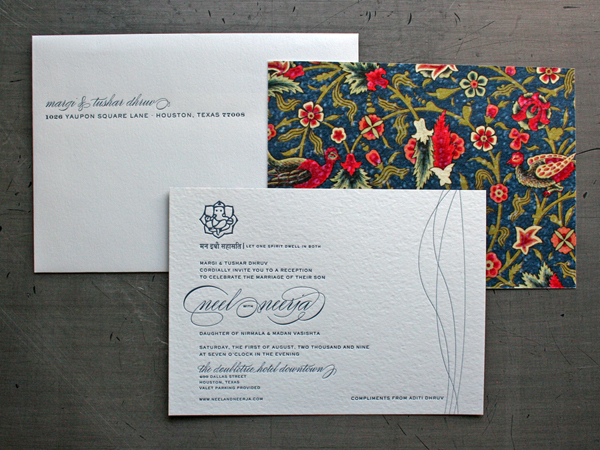 She wanted to incorporate a painting with her invitation so we printed one on vellum as a cover sheet for the invite." Priya: "We needed to design invitations for not only her wedding in Virginia, but also a reception the weekend after in Texas that is hosted by the groom Neel's parents. We also wanted both events to be linked visually, thus the full color nature elements." Since the invite was sized for a large A10 envelope, that made for a very large 13 x 20 press sheet that incorporated all the wedding cards. In this wedding, there were two main invite cards - the brides invitation and the grooms invitation. Plus the other reply cards, direction cards and sangeet invitation. That's a lot of letterpress! Producing multiple pieces on the same press sheet keeps the cost down. We produced the design from Priya with a combination of letterpress and digital printing. Digital printing is used for the vellum sheet and the back of the reception card. All of the navy text is letterpress printed. The paper stock is 111lb (300gsm) Canaletto Grana Grossa 20% cotton from Gruppo Cordenons. We also die cut the contrasting navy paper for the folding enclosure using French Papers Nightshift Blue and mixed our printing ink to cordinate with the navy paper. The minimal typography and ornamental detail of this design were perfectly suited for letterpress printing and produced a beautiful sculptural impression.